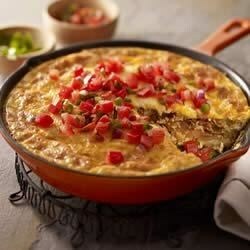 "Kick start your day with this zesty omelet filled to the brim with spicy sausage, green chile peppers, and melted Mexican-style cheese." Cook chorizo and onions in medium ovenproof skillet on medium heat 8 min. or until chorizo is done, stirring frequently. Add potatoes and chiles; cook 2 min., stirring occasionally. Remove from heat. Stir in 1/2 cup cheese; spread to form even layer in skillet. Whisk eggs and sour cream until well blended; pour over chorizo mixture. Top with remaining cheese. Bake 25 min. or until center is set. Serve topped with salsa. If you don't have an ovenproof skillet, wrap the handle of your regular skillet with several layers of foil before placing in oven. Remember that all parts of the skillet will be hot when removing it from the oven. This is great! We saved the leftovers and made breakfast burros the next day!